Four tiger cubs died reportedly due to starvation in the Saoli forest range here, prompting the Maharashtra government to order a probe into the matter. "The tiger cubs died reportedly due to starvation. The forest officials are tyring to trace their mother," S S Dole, General Manager, Forest Development Corporation of Maharashtra Limited, Chandrapur told PTI today adding that while three cubs were found dead the fourth one succumbed later. This morning villagers of Pathri first detected the three carcasses of tiger cubs under Saoli forest range near Gosikhurd canal. The spot is at-least 50 kilo-meters away from the Tadoba tiger sanctuary. 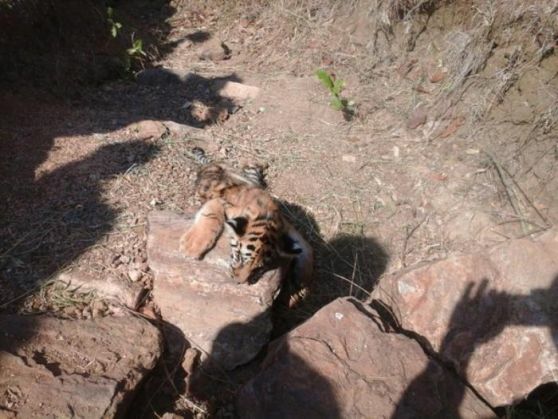 On being informed, the forest officials searched the area and found another cub which was alive. Then it was to Chandrapur for treatment, but it did not survive, Dole said. The postmortem is likely to be performed tomorrow, said Mukesh Bhandakar, representative of Principal Chief Conservator of Forests. Meanwhile, Maharashtra Forest Minister Sudhir Mungantiwar visited the veterinary hospital, Chandrapur, where one of the cub was being treated. "I have given orders to conduct a probe. I have also given instructions to trace the mother tigress," Mungantiwar told PTI. Dole said prima facie it did not look like poachers had killed the cubs as their body parts were intact. "The forest men have installed three camera traps to trace the tigress. The preliminary report suggests that the cubs might have died due to starvation as they were feeding cub," he added.